You, my dear readers, know that I am a rather avid sock knitter. I love knitting socks, I love wearing hand-knitted socks, I love giving my hand-knitted socks to sock-worthy recipients. I’ve hand-knitted at least 150 pairs of socks in the past 15 years and my joy in knitting socks hasn’t diminished in the least. When I first started knitting socks, I loved to try different patterns. I enjoyed knitting challenging patterns and trying new techniques. But after all these years, I have discovered which sock knitting techniques I enjoy the most and which give me the best results. I now prefer simple patterns and generally avoid patterns that require a great deal of attention. The vast majority of the socks I have made were knitted cuff down with a heel-flap-and-gusset heel. I used to hate making socks toe up. The toes didn’t fit right, the short-row heels looked awful and didn’t fit my high instep, and I never seemed to be able to start the heel in the proper place, so the foot would inevitably be either too long or too short. I’d end up with ill-fitting socks that looked like they were knitted by a novice. But because there are situations in which toe up is the better option, I kept trying. Through trial and error, I finally figured out how to knit toe-up socks that fit me and look good, too. I found a really nice cast on (Judy’s Magic) and a well-fitting toe (Chrissy Gardiner’s shaped round). 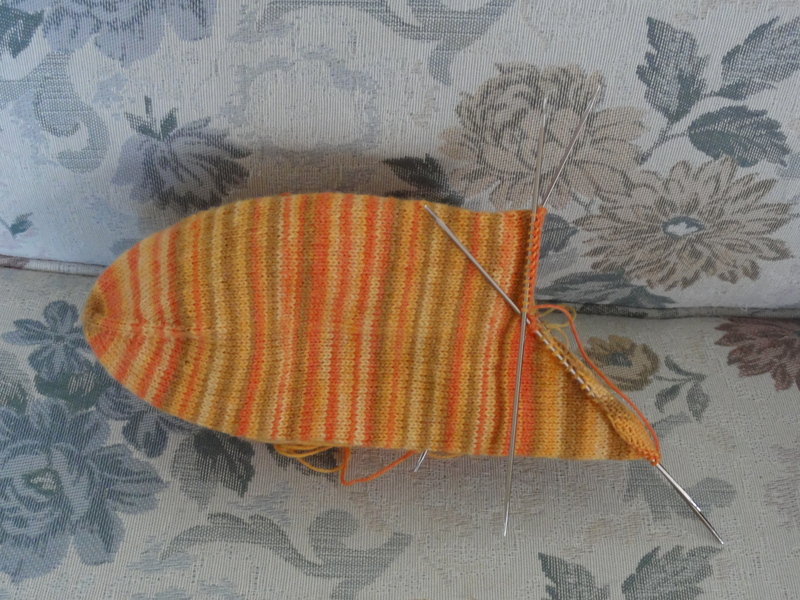 I discovered how to knit a short-row heel in both toe-up and cuff-down socks that fits my high instep–just knit the heel on 60% of the stitches instead of 50% of the stitches. And I found a way, thanks to sock designer Debbie O’Neill, to make very attractive short rows without having to pick up and knit the wraps. The result is that I feel confident to make a short-row heel in a cuff-down sock when doing a heel-flap-and-gusset heel would disrupt the patterning of the yarn colors and I don’t hesitate to knit socks toe up if I’m concerned I might run out of yarn or if I’m too lazy to convert a pattern from toe up to cuff down. And sometimes I knit socks toe up just because I can. That’s what I did when I decided to knit up the gorgeous Trekking XXL sock yarn that is in the process of becoming the Vanilla Candy Corn Socks. The pattern for these socks is definitely plain vanilla, but these socks are going to be anything but plain, thanks to the gorgeous colorway. This entry was posted in Knitting, Socks and tagged hand knitted socks, knitted socks, toe-up socks, Trekking XXL. Bookmark the permalink. Your sock is coming right along and I love that yarn even more now. Sometimes, when the yarn is so striking, the sock doesn’t need to be fancy. I use Judy’s cast on also and need to find more information on the rounded toe and short rows without wraps. For the shaped round toe, you simply increase every row for 4 rows (or more, depending on what your final stitch count is), then increase every other row until you have the number of stitches you need for the foot. Chrissy Gardiner has a formula and worksheet in her book on toe-up socks to help you figure it out. The quick increases flatten the tip of the toe so you don’t end up with pointy toes. The short rows have wraps, but the wraps are not picked up and knitted. They are just left in place. This creates a line of tiny eyelets that are not only decorative, but they look the same on both sides of the heel. Thank you for all the information! New techniques to add to my list. I wish I could give them a try but all my socks are cuff down right now. Soon . . .
Hi, I find that my toe up socks don’t fit my toes very well – how can I find more information on “a well-fitting toe (Chrissy Gardiner’s shaped round)”? Thanks! There’s a formula and worksheet in Chrissy Gardiner’s book, Toe Up Socks. Basically, you do increases every row for a certain number of rows, depending upon how many stitches you want to end up with, then increase every other row. She has several other toes in the book, too, including one that is anatomically correct, which creates a left sock and a right sock. It’s a really outstanding book with lots of great techniques and some nice sock patterns, too. Hi, I find your enthusiasm with socks after years of knitting them so lovely! I’m a relatively new sock knitter (3 years or so) and I’m thrilled to start a new pair of socks every time I do it. With toe-up socks I used to have the same problem until I changed the toe to an asymmetrical wedge, which is so smooth and comfortable. I still prefer cuff-down socks though, but I can see and agree with your reasoning. The colourway of your socks is yummie!